Hōjō Masako (北条 政子, 1156- 1225) is known in Japanese history as the “nun shogun” or “ama shogun” (尼将軍) because of her role in the founding of the Kamakura shogunate by her husband, Minamoto no Yoritomo, and because of the powerful position she assumed in the government after his death. Born in 1156 as the eldest daughter of the leader of the influential Hōjō clan, Hōjō Tokimasa (北条時政), she grew up a tomboy and fell in love with Yoritomo no Minamoto, who was then a prisoner exiled by the ruling Taira clan. The two fled to the mountains of Izu, where they married and lived under the protection of warrior monks. The Minamoto clan reasserted their hegemony in the Genpei War, and by 1185 Yoritomo no Minamoto was the undisputed leader of Japan. Hōjō Masako and her family had supported Yoritomo, and when he was named the first Shogun in 1192 by the Cloistered Emperor Go-Shirakawa, he shared that power with his wife Masako. After Yoritomo’s death in 1199, their two sons ruled as the second and third Shoguns and Masako’s father, Hōjō Tokimasa, acted as regent. Masako shaved her head and became a nun, but remained active in political affairs. A series of internal power struggles and tragedies eliminated all male heirs, and Masako became the guardian of the infant Shogun 'Fujiwara no Yoritsune (藤原頼経), a descendant of her husband’s lineage. On numerous occasions, Masako acted to strengthen the power of the Shogunate and protect her position. In 1221, when the Cloistered Emperor Go-Toba attempted to rebel against the Shogun and establish himself as ruler, Masako rallied the fearful Shogunate samurai with a powerful speech. Hōjō Tokimasa and his son then led 190,000 samurai to take Kyoto and exile the Emperor. After Tokimasa’s sudden death in 1224, Masako put down an attempt by the Miura clan to overthrow her government. Hojo Masako was one of the most powerful women leaders in Japanese political history. During the Heiji Rebellion（平治の乱, in 1159, the Taira clan, under Taira no Kiyomori (平清盛), with the support of Cloistered Emperor Go-Shirakawa（後白河天皇） defeated the Minamoto (源) clan, under the leadership of Minamoto no Yoshitomo（源義朝）. Yoshitomo was executed, and his sons and daughters were either executed or sent to nunneries. Only three of his sons survived. Minamoto no Yoshitsune (源義経) and Minamoto no Noriyori (源範頼）were forced into the priesthood, while Minamoto no Yoritomo (源頼朝), only thirteen, was spared and sent to exile in Izu, the domain of Hōjō Tokimasa. Masako was barely an infant while all this was taking place. The Taira clan, under Kiyomori, had successfully taken control of Japan. Masako had an elder brother, Hōjō Munetoki (北条宗時), and in 1163 a younger brother, Yoshitoki (義時), was born. Later another brother, Hōjō Tokifusa (時房) would be born, and another sister, whose name is lost to history. Until her marriage in 1179, Masako lived the life of a tomboy, horseback riding, hunting, and fishing, and eating with the men rather than with her mother, sister, and the other women of the household. Around 1177 Masako met the young exile Yoritomo, and the two fell in love. Her father found out about their relationship and, concerned because he feared it would arouse the wrath of the Taira clan, tried to arrange a marriage for her with Yamaki Kanetaka (山木兼隆), a member of the Taira clan and a guard over Minamoto no Yoritomo. Masako ran away with Yoritomo and they took refuge in the mountains of Izu, where the soldier monks were so powerful that even Yamaki Kanetaka could not pursue them there. Masako and Yoritomo were married, and in 1180, they had their first daughter, Ō-Hime (大姫). The disgruntled Imperial Prince Mochihito, (以仁王 d. July, 1180), also known as the Takakura Prince, and as Minamoto Mochimitsu, was the son of Cloistered Emperor Go-Shirakawa, and thought that the Taira had denied him the throne in order to offer it to Emperor Antoku（安徳天皇）, who was half Taira himself. In 1180 Prince Mochihito called upon the remaining members of the Minamoto clan to overthrow the Taira and support his bid for the throne. In May of 1180, Minamoto no Yorimasa sent out a call to other Minamoto leaders, and to the monasteries (Enryakuji, Miidera and others) that Taira no Kiyomori had offended, asking for assistance against the Taira, in the name of Prince Mochihito. Learning of this, Kiyomori sent his men to capture Mochihito, who retreated to Miidera, at the foot of Mount Hiei. Here, he discovered that the warrior monks of Miidera, for various political reasons, could not rely on the support of any other monasteries, and fled once more, along with a small Minamoto force, across the River Uji, to the Phoenix Hall of the Byōdō-in. There they were caught by the Taira forces, and the Battle of Uji ensued. Much of the fighting took place on the bridge over the River Uji. The Minamoto warriors smashed the planks of the bridge to stop the Taira from crossing, but eventually they were forced back into the Phoenix Hall, where Yorimasa committed seppuku. Prince Mochihito escaped to Nara, but was captured on the way and killed soon afterwards. Although Prince Mochihito’s plan to overcome the Taira clan had failed, the Battle of Uji prompted the Minamoto clan leader, Minamoto no Yoritomo, to take up arms with the support of the Hōjō and Tokimasa and Masako, and begin the Genpei War, the final war between the Minamoto and Taira clans. In 1180, Masako's elder brother Munetoki was killed at the Battle of Ishibashiyama, and Yoshitoki (義時) became heir of the Hōjō clan. In 1181, Taira no Kiyomori died, leaving the Taira in the hands of Taira no Munemori, (平宗盛), his son. In 1182, Masako's brother Yoshitoki (義時) married, and that same year, Masako and Yoritomo had their first son, Minamoto no Yoriie (源頼家), who would be the heir. The Minamoto headquarters were at the city of Kamakura, to the east of Izu in Sagami Province. In 1183, Minamoto no Yoshinaka (源義仲), Yoritomo's rival and cousin, took Kyoto, driving the Taira (and Emperor Antoku) to Shikoku and quickly installing Emperor Go-Toba. Yoritomo's half brothers, Minamoto no Yoshitsune (源義経) and Minamoto no Noriyori (源範頼), drove Yoshinaka out and executed him, and took Kyoto in the name of Yoritomo (and the Hōjō clan). By 1185, the Taira clan had been wiped out. Munemori was executed, and the remaining Taira (including the young Emperor Antoku) were either executed, or committed suicide by drowning. Minamoto no Yoritomo was now the undisputed leader of Japan, and his wife, Hōjō Masako, and her family had stood by Yoritomo through it all. An internal power struggle, fueled by his new allegiance to his wife's family and her dislike of her brothers-in-law, resulted in the immediate arrest and execution of Yoshitsune and Noriyori, after all they had done to win the Genpei War in Yoritomo's name. Yoritomo received approval from Cloistered Emperor Go-Shirakawa in Kyoto to create new titles and administrative roles, such as shugo and jitō, which were under the control of the shogun and strengthened his hold over the nation. The capital was not moved to Kyoto, but remained in the Minamoto headquarters of Kamakura, away from the imperial court. In 1192, Yoritomo was named Shogun by Cloistered Emperor Go-Shirakawa, who died later that year. Yoritomo was now the most powerful man in Japan, and he shared that power with his wife Masako. The Hōjō clan were now also very powerful. That same year, Masako and Yoritomo had another son, Minamoto no Sanetomo (源実朝). In 1199, Minamoto no Yoritomo died, and was succeeded as shogun by his son, Minamoto no Yoriie (源頼家). Since Yoriie was only eighteen, Hōjō Tokimasa （北条時政）、Masako’s father, proclaimed himself shikken or regent for Yoriie. Masako was also in a position of power, as mother of the shogun. Nonetheless, since her husband was dead, she shaved her head and became a Buddhist nun, receiving a tonsure from the priest Gyōyū. She did not take up residence in a monastery or a nunnery, and still involved herself in politics. She, her father Tokimasa, and her brother Yoshitoki (義時) created a council of regents for the eighteen-year-old Yoriie, but the headstrong shogun hated his mother's family and preferred his wife's family, the Hiki clan (比企), and his father-in-law, Hiki Yoshikazu (比企能員). Hōjō Masako overheard Hiki Yoshikazu (比企能員) and Minamoto no Yoriie (源頼家) hatching a plot together, and reported her own son to Hōjō Tokimasa （北条時政）, Tokimasa did not harm Yoriie, but ordered Yoshikazu executed in 1203. Shogun Yoriie, suffering from an illness, retired to Izu Province where, unknown to his mother Masako, he was murdered in 1204 on Tokimasa's orders. Minamoto no Ichiman (源一幡), Yoriie's eldest son and heir and Masako's grandson, was also executed during the murders and purges of the Hiki clan, because his mother was a Hiki. In 1203, Masako's other son by Yoritomo, Minamoto no Sanetomo (源実朝), became the third shogun, with Tokimasa as regent. Shogun Sanetomo (源実朝), was not like his despotic older brother, the former Shogun Minamoto no Yoriie (源頼家), but was instead a man of culture who tried to unite with the Imperial Court. Emperor Go-Toba (後鳥羽天皇) respected Minamoto no Sanetomo and treated him well, but some of Shogun Sanetomo’s followers complained about his policy of cooperating with the Imperial Court. In order to avoid more misfortune, Masako sent the surviving children of former Shogun Minamoto no Yoriie (源頼家) to enter the Buddhist priesthood. One of them was the second son Kugyo (公暁), who was sent to Tsurugaoka (鶴岡八幡宮), the most important shrine in the city of Kamakura. Shogun Sanetomo was closer to his mother's side than his elder brother had been. Masako and her brother Yoshitoki (義時), the heir of the Hōjō clan, were angry with their father Hōjō Tokimasa （北条時政）, especially after their mother, Hōjō no Maki, died in 1204. They discovered that Hōjō Tokimasa （北条時政）and his second wife Maki no Kata (牧の方) were scheming to oust Shogun Sanetomo (源実朝). Hōjō Tokimasa (北条時政）abdicated in 1205, and was sent off to a monastery in Kamakura, where he shaved his head and remained a monk until he died in 1215. Masako’s brother Yoshitoki (義時) took the place of Hōjō Tokimasa as shikken or regent for Shogun Sanetomo(源実朝). 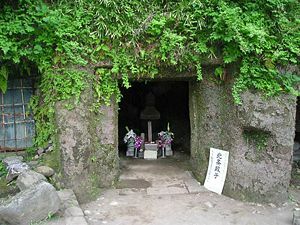 The tomb of Hōjō Masako in Kamakura, Japan. In 1205, even though Hōjō Tokimasa （北条時政）had been ousted, Minamoto no Sanetomo was shogun and the position of the Hōjō clan was still secure. Masako's brother, Yoshitoki (義時) had succeeded as shikken for Shogun Sanetomo, while Masako was in a powerful position as a negotiator with the court. In 1218, because shogun Sanetomo has no son, she was sent by Regent Yoshitoki to ask Cloistered Emperor Go-Toba if Shogun Sanetomo could adopt one of his sons, such as Imperial Prince Nagahito, as an heir, but Go-Toba refused. As the next shogun, Masako and Regent Yoshitoki finally decided on Kujo Yoritsune (九条頼経), otherwise known as 'Fujiwara no Yoritsune (藤原頼経), who was still a baby, and not a Hōjō nor a male-line Minamoto, but a member of the Kujō clan, which was part of the Fujiwara clan. Yoritsune's grandmother had been a niece of the first Shogun Yoritomo. Yoritsune remained a figurehead for the Hōjō, even later in his adulthood. Since Yoritsune was still a small child, Masako acted as shogun in his place, as the guardian of Shogun 'Fujiwara no Yoritsune (藤原頼経). Because of her position Masako was called the ama “nun” Shogun (尼将軍). In 1221, Cloistered Emperor Go-Toba rebelled against the Hōjō, and attempted to restore power to the emperor. He raised an army in Kyoto and called on all Japan to conquer the Shogunate. The samurai of the Shogunate trembled in fear at this, because they were in great awe of the Imperial court. Masako gave a famous speech before the samurai of the Shogunate in Kamakura. With tears, she urged them to be grateful and remember the kindness, higher than a mountain and deeper than the sea, of her husband, the first Shogun Minamoto no Yoritomo. Hearing this speech, the troubled samurai and followers of the Shogunate became calm. Regent Yoshitoki and his eldest son and heir, Hōjō Yasutoki (北条泰時), attacked Kyoto with 190,000 samurai, regained the city and exiled Cloistered Emperor Go-Toba. This was known as the abortive Jōkyū War (承久の乱), or the Jōkyū Disturbance. In 1224, Hōjō Yoshitoki died of a sudden illness and was succeeded by his eldest son and heir, Hōjō Yasutoki (北条泰時), Masako's nephew. The powerful Miura clan (三浦), led by Miura Yoshimura (三浦義村) and supported by Hōjō Yoshitoki (北条義時)’s second wife, attempted to topple the Hōjō government of Regent Yasutoki, Masako, and Shogun Yoritsune. Masako rushed to negotiate; the Miura were put down, and Hōjō Yasutoki（北条泰時）was instated as the Hōjō regent. 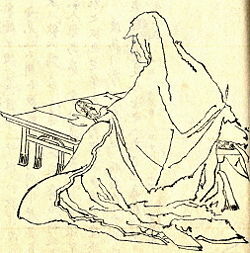 In 1225, Hōjō Masako died at the age of sixty-nine. She is remembered in history as the ama-shogun, or the "nun-shogun," because of her true example of cloistered rule. Asakawa, Kan’ichi. 1933. The founding of the Shogunate by Minamoto-no-Yoritomo. [Praha: Institut Kondakov. Asakawa, Kan’ichi. 1965. Land and society in medieval Japan; studies by Kan'ichi Asakawa. Tokyo: Japan Society for the Promotion of Science. This page was last modified on 11 January 2018, at 16:50.